Here we have another episode of the great Mystery Science Theater 3000 put out by Shout! Factory. This time, Mike Nelson, Crow T. Robot and Tom Servo tackle a laughably dubbed, German, made for television production of Hamlet, starring Maximilian Schell. Being the poorly read chap that I am, I have never actually read Hamlet nor seen any movie adaptions so this is probably the worst way to first see Hamlet. Then again, I couldn't give two shits about Shakespeare so this is really the only way I would. For anyone interested, Hamlet is the story of a guy whose father has been killed by his uncle, who then marries Hamlet's mother. Hamlet then sees his father's ghost and goes crazy. At least that's what I got from it. I could be totally wrong, but once again I just couldn't care less about the story. What I do know is that Mike and his robot sidekicks seem to know the story well because they do a good job of narrating and keeping the characters straight, all while killing the dark, serious tone of the film with their machine gun fire quips. Like I stated before, I don't know much Shakespeare so what's great about this episode is that it is both hilarious and a learning experience. The MST3K boys usually are forced to sit through low budget sci fi, monster or other b movie oddities so Hamlet is not what one would expect to see on the show. True it is a cheesy, low budget Hamlet but it's still Hamlet. That to me proves how inventive and brilliant this show is. This episode is quite funny and I found myself laughing out loud several times throughout. The movie was hard to sit through but Mike, Crow and Servo (I'm sorry, I mean Sirveaux) made it tolerable, even enjoyable. There were some parts that were even a little too slow for the crew's comical anecdotes, but it's still definitely worth a watch. 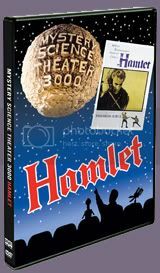 MST3K: Hamlet is a Shout Select title, only available through Shout! Factory's website. You can pre-order it HERE or it is also available in a bundle with Gunslinger with free shipping and a free MST3K stress ball HERE and a 4 DVD Select Bundle with Gunslinger, Beginning of the End and The Incredibly Strange Creatures Who Stopped Living and Became Mixed-Up Zombies HERE with $10 off, free shipping and a free MST3K stress ball.